Well I met Terri Cheney from NHS in 1981 , thanks to John Simpson. Got married in 1983 and moved to Kansas City. We have 3 children and 2 grandchildren : Izabelle Nicole - 3 and Brookelynn Richelle - 3 mos. We moved back to the Sioux City area in 1997. You can find us Friday nights at Chili's here in Sioux City, just ask if Bob & Terri are here, they know us. We can also be found at a new bar here in Sioux City called "The Firehouse Bar". They play 70's and 80's rock and roll music (plus I helped build it,lol). Life has been pretty good to me so far , beautiful wife and great kids. I hope to hear from some of the class soon. Robert Tomlinson has a birthday today. Robert Tomlinson updated his profile. View. 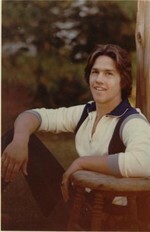 Here I am,Class of 1979. My family, Anthony,Myself,Terri,Shannon and Ashlei at our 25th wedding anniversary, Feb 2008. My wife Terri & I with our 1st grandaughter, Izabelle. Our daughter Ashlei senior year. Our son Anthony senior year.